Knights of Creativity Spirit & Ale: Yes, if you say so. Getting people to say, "Yes." That's the goal for any selling message. 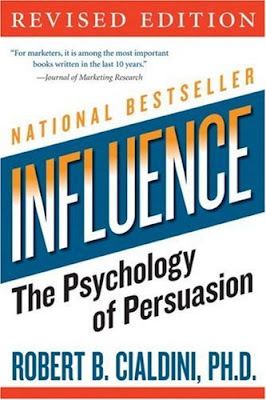 And it's the focus of study for psychologists who explore the principles of influence and persuasion. ted in the right way. At work is more than simple technique. The principles discovered by these researchers are basic to our human nature, deep-seated and powerful. So powerful, in fact, that they are, in some circumstances, all but impossible to resist;Take for instance this example, In Influence: The Psychology of Persuasion by Robert B. Cialdini, a respected social scientist, of a stick and a few red feathers. "My grandfather spent almost every moment of every day weeding his strawberry patch, plowing up earth for next year's corn, hunting squirrels in the surrounding woods — whatever kept him outside and active. Over the years, he learned a lot about the simple things most of us ignore. When I was a boy, I tagged along like a curious puppy, endlessly fascinated by his arcane knowledge. One day, he handed me a long stick with a clump of red feathers taped to the end and said he wanted to show me something. He had a familiar, mischievous look in his eye, so I knew it would be fun. In a tree near his tool shed, a family of robins had nested. We slowly and quietly worked our way to just beneath the tree, and my grandfather told me to carefully raise the feather end of the stick up to the nest. Nearby, a male redbreasted robin stood guard. When he saw the red feathers, he immediately attacked them, chirping wildly and flapping his wings in distress. I was dumbfounded. Between chuckles, my grandfather explained that red feathers made the bird go berserk. I asked why, and he told me he wasn't sure, but figured that the bird thought the clump of feathers was another robin. He said robins protect their territory and will attack another robin on sight." Experiments have demonstrated that a male robin will attack a simple bunch of red feathers but ignore a detailed replica of an actual male robin that does not have red feathers. This is an example of what scientists call "fixed-action patterns" in animals. A fixed action pattern is a precise and predictable sequence of behavior. It's instinctive. There's no thought involved, just automatic response. This sequence is set in motion by a very specific "trigger." For the robin, the red feathers are the trigger, and they set off a sequence of attack. Generally, the trigger works properly, since the red feathers are usually attached to a male redbreasted robin and not to a stick. However, the trigger works even in the absence of another bird — all that's required is a bunch of red feathers. Fixed-action patterns are common among animals. But what about humans? What if you could use a trigger to set off a desirable sequence of behavior in a prospect, customer, or donor — like saying "yes" to a request you make? Actually, you can. Robert B. Cialdini, concludes that "... this automatic, stereotyped behavior is prevalent in much of human action ..."
He cites an experiment by Harvard social psychologist Ellen Langer, where you can see this concept in action. Langer approached people waiting in line to use a copy machine and asked, "Excuse me, I have five pages. May I use the Xerox machine?" About 60% said, "Yes." Under similar circumstances, she did the same thing, but instead asked, "Excuse me, I have five pages. May I use the Xerox machine because I have to make some copies?" In this case, an overwhelming 93% said, "Yes." What happened to increase the "yes" response so dramatically? It's a well-known principle that people like to have a reason. A reason helps people make a decision and justify their action. However, in this experiment, "because I have to make some copies" does not provide any new information. It does not actually give a reason. Therefore, merely using the word "because" initiated a positive response. "Because" is usually followed by information and has become, for most people, a "trigger." Once the trigger is learned, it is powerful enough to set in motion a behavior sequence, in this case a "yes" response, even in the absence of concrete information. Life is complicated. Animals have evolved ways to make life simpler by taking behavioral shortcuts. The male redbreasted robin can't spend every moment identifying each new bird that flies by, so it just reacts to the one discerning feature that separates a rival male redbreasted robin from jays and sparrows and crows and all other birds. Likewise, we humans can't possibly think through every situation from scratch, so we also have "triggers" that set off automatic, unthinking action. Our brain is built to help us simplify life by identifying patterns moment-by-moment, and automatically setting in motion set sequences of standard, well-rehearsed behavior. Someone says "Good morning" to you, and without thinking, you say it back. You see an octagonal red sign at an intersection, and you automatically stop your car (or at least slow down). A group of people around you laugh, and you laugh right along even if you didn't hear the joke. Human triggers and patterns of response are more varied and complex, and certainly less predictable. And people are more aware than ever of the manipulative nature of selling and advertising. However, if you can discover the most powerful human behavior sequences and find the thing that triggers them, you can lead people to say "yes" to your requests more often. Reciprocation — There is an overwhelming urge to repay debts, to do something in return when something is done for us. This deep-seated urge is so strong, noted paleontologist Richard Leaky has said that it is the very essence of what it means to be human. And sociologist Alvin Gouldner points out that no society on Earth escapes the reciprocity principle. Commitment and Consistency — We are driven to remain consistent in our attitudes, words, and actions. So, when we are led to make a commitment of some kind, to go on record or take a stand or make a decision, there is an urge to remain consistent with that original commitment later on. The key is to get the commitment, which can appear small, reasonable, and innocent. This commitment can not only lead to influence via the principle of consistency, but also to further influence for larger requests. Social Proof — Most of us are imitators in most of what we do. We look to others for guidance, especially when we are uncertain about something. We ask, "What do others think about this? What do others feel? What do others do?" Then we act accordingly. Liking — No matter how reasonable we may think ourselves to be, we are always more likely to say "yes" to those we know and like. We readily comply with requests from those who are similar to us and for whom we have good feelings. It's what makes refusing to buy Tupperware from a friend or relative next to impossible. Authority — In this age of specialization, we are more prone to respond to authority than ever before. Regardless of an independent spirit, we look to experts or those we perceive to be experts to give us the answers and show us the way. Even the mere symbols of authority, like titles and clothing, are enough to trigger a response. Scarcity — In general, the fear of loss is more powerful than the hope of gain. By properly manipulating the instinctive tendency to avoid losing what one already possesses — or avoid losing the chance to possess something desirable — you can trigger a favorable response. That all said.. The Ladies amongst our group, know that most guys are big dumb schmucks and can be led by the nose to do pretty much anything, given the right prospects, as this "Point of View" video clearly demonstrates. Sir Dayvd ( who knows his own failings and avoids them at all costs ) of Oxfordshire. Perfect timing Sir D! I'm attending a Medical Marketing Conference in Orlando, where among other things, I'm trying to get people to say yes. I'll use "because" alot today and see if that works! Be the Cause you want! Sir Bowie "feeling like pulling a trigger here at work (a different kind of trigger), because..."
An insightfull post. Will definitely help.